February 17, 2011 - GE Capital Aviation Services Limited (GECAS), the commercial aircraft leasing and financing unit of GE, announced two new transactions with AVIANCA TACA involving 16 Airbus aircraft. GECAS signed a purchase and leaseback transaction for two new Airbus A330-200s and four new Airbus A320s. The aircraft are part of AVIANCA TACA?s existing order book with Airbus. 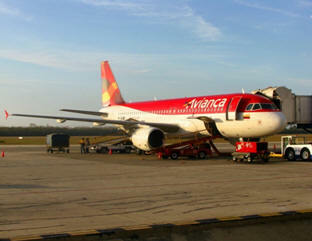 Two of the A320s will be operated by Taca, the remainder will be operated by Avianca. Additionally, GECAS has leased 10 Airbus A318s to Avianca. ?We are pleased to contribute to the fleet renewal and growth of AVIANCA TACA with these two transactions,? said Norman C.T. Liu, president and CEO, GECAS. Fabio Villegas, CEO of AVIANCA TACA noted: ?It has been very important for AVIANCA TACA to have GECAS as our strategic partner in the modernization of our aircraft fleet. They have supported this transition to a fleet made up entirely of Airbus aircraft for passengers to enjoy their travels in the Americas and throughout the world.? Avianca is the flag carrier airline of Colombia since 5 December 1919 when it was registered initially under the name SCADTA. It is headquartered in Bogot?, D.C. with its hub at the El Dorado International Airport. Avianca is the largest airline in Colombia and a major one in Latin America. Avianca together with its subsidiaries has the most extended network of (both passenger and cargo) destinations in the Americas and one of the largest and most modern aircraft fleet in the continent. It is wholly owned by Avianca-TACA Ltd., a Latin American holding company established in the Bahamas and specialized in air transport. The airline is listed on the Colombian Stock Exchange but it has not issued shares yet. On October 7, 2009, it was announced that Avianca would merge with TACA but both airlines have stated that each will maintain their own identity and operate separately for the moment. In 2009 Avianca turned 90 (years) making it one of the world's oldest airlines still in operation; It is actually the oldest continuously operating airline in the Western Hemisphere. Since April 26, 2010, OceanAir is being rebranded Avianca in the same way as it was done with SAM years ago and it would do with other subsidiaries (for example, VIP is partially rebranded) to place Avianca as the leading airline in Latin America. On November 10, 2010, Avianca and Taca were accepted to be part of Star Alliance in a process that will last around 18 months until both airlines fulfill all requirements to be official members of the Alliance. GECAS, the U.S. and Irish commercial aircraft financing and leasing business of GE, has a fleet of over 1,800 owned and managed aircraft with approximately 245 airlines in over 75 countries. GECAS offers a wide range of aircraft types and financing options, including operating leases and secured debt financing, and also provides productivity solutions including spare engine leasing, spare parts financing and management. GECAS, a unit of GE Capital, has offices in 25 cities around the world.